Save on a room or suite at the famous Pyramid hotel in Las Vegas! Prices start at just $44 per night when you use our Luxor Hotel Las Vegas deals. Just click on your friend Coupon Puppet below to visit Hotels.com for the lowest rate at this iconic hotel. Ah, Luxor. In a modern Vegas of boutique hotels, “craft cocktails” and themeless hotels, thank goodness the Luxor Hotel Las Vegas still exists! You know the Luxor…it’s that iconic pyramid that is literally a beacon in the night on the South side of The Strip. 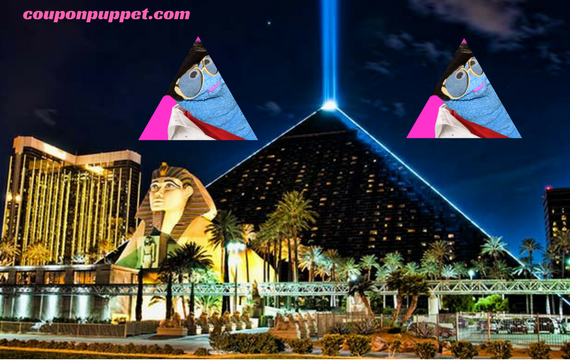 Coupon Puppet always gets a little excited when she sees the beam of light shining above the Luxor as her plane or car nears Las Vegas. Its exterior is truly one of the landmarks that makes the Vegas skyline so memorable. And when you step inside, the interior does not disappoint! There is gold everywhere you look, and an elevator that travels diagonally up and down the pyramid. We’ll be honest…the restaurant options within the Luxor are not as dazzling as some other Vegas hotels. But Mandalay Bay and Excalibur are on either side, so the chances of you going hungry are slim. If you are loathe to leave The Luxor, Coupon Puppet recommends T&T Tacos and Tequila for tasty Mexican, or Rice and Company for Asian cuisine. The Luxor buffet is also fairly well regarded. Entertainment options at Luxor Hotel Las Vegas are almost as iconic as the pyramid itself, what with Blue Man Group, Carrot Top and magic courtesy of Criss Angel. Coupon Puppet Loves Saving You Money With Luxor Hotel Las Vegas Deals! ← Viva Las Vegas Travel Deals!